Having found my way to their website, I discovered booklets with beautifully illustrated covers on a range of subjects - most, not all, are poetry anthologies. I wasn't sure what to expect when I opened my copy of 'Ten Poems about Sheds'; probably a few lighthearted, jolly poems. I know I imagined shades of Roald Dahl or Edward Lear. Instead I found a collection of thoughtful, evocative, free verse poems. "A shed may be just a place to keep the lawnmower, or it may be somewhere to escape to in order to write or paint. Sometimes it's a haven in which to daydream when the house is full of noise and bustle [...] These enchanting poems will lead you quietly into private worlds where you'll find you're entirely at home." For me, the word 'shed' takes me back to my grandpa's garden where I can still see the black shed where he stored and maintained his tools. I'm not sure I was allowed inside, perhaps just a peek from the doorway to watch him work, but I remember the smells of creosote, linseed oil, wood and earth. Heady stuff for a small girl keen on digging. I thought it a magical curious place. And that's the power I found in these poems, each one evoked a different memory or train of thought and I found myself lingering over the words. Isn't that what a card or letter should do? Because that's the brilliant thing about these booklets - they're designed to be sent instead of a card. While I love to get birthday or christmas cards, I've always regretted the waste; they're usually not something you'd want to keep forever, and I prefer things to have more longevity. No, cards are heartwarming to receive but inevitably - and regrettably - soon recycled. of sawdust, linseed, two-stroke oil ..."
The A5 sized booklets have a quality feel, being printed on smooth, matte, white paper with a heavier card cover. They're packaged in a cellophane wrap with a sturdy envelope plus a very handy bookmark with space for a personal message. Each card is £4.95 plus postage, not a huge amount more than the cost of an average greetings card and yet offering so much more. Although I was asked to review 'Ten Poems about Sheds', I couldn't resist taking a look at a couple of the other booklets. Having read them, I've been drawn back to re-read them many times. 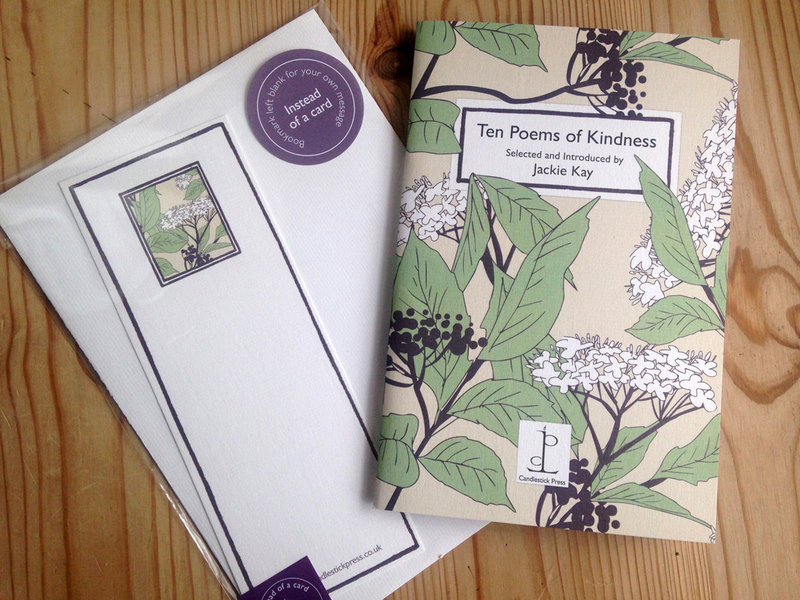 Ten Poems of Kindness: The back cover explains: "A simple and almost old-fashioned word, kindness is an underestimated virtue in our increasingly hectic and impersonal world. These generous poems remind us that kindness can take many forms and doesn't have to be time-consuming or complicated." The book includes an open letter from the mother of Felix Alexander, the 17 year old boy who took his life in 2016 after years of cyber-bullying. In the letter she exhorts people to "be kind always". The introduction is written by poet Jackie Kay who writes, "Being kind allows you to see the sunlight through the leaves." I'll happily promote anything that inspires people to be more kind to each other. In his introduction to Ten Poems about Gardens, Monty Don writes "These are all fine poems, all perfectly practical celebrations of why and how to garden. Read them with soil under your nails and to cultivate all that grows within. Read them and go out and garden the better for it." There's a fabulous poem about allotments in this selection that made me smile, as well as an ode to the passions that Sissinghurst has seen and another, Vespers, that starts, "I don't wonder where you are any more; you're in the garden ..." That should strike a chord with more than a few folk I know! But my absolute favourite (so far, hah!) has to be the story of The Wood in Winter; the phrasing is hauntingly beautiful and I love the cover. 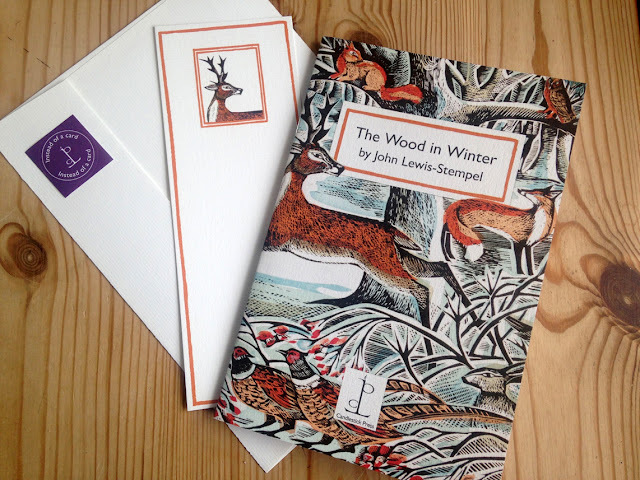 The author is John Lewis-Stempel, an award winning nature writer. 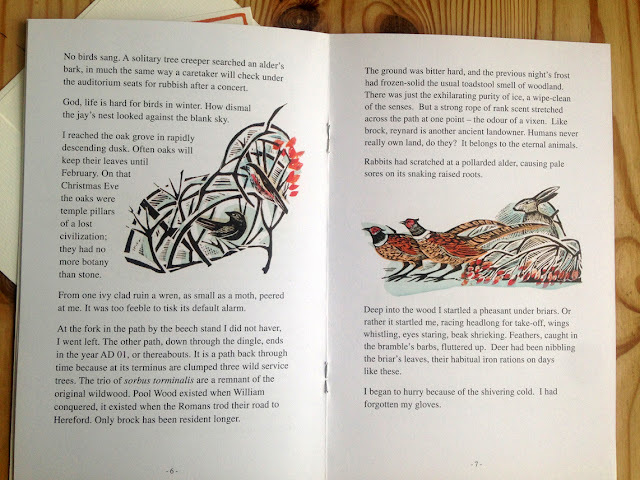 The back cover introduces us: 'He writes about why being in a wood in winter strips us to our essential soul, and how close encounters with the animals who thrive in this hard season remind us of our own deep connection to the earth.' I particularly enjoyed the narrator's encounter with a fox in the snow: "... the vixen, quite oblivious to the weather, and to me. Even through pelting snow and half-light her fur lustred. She burned alive. The red fox." Or birds: "Some rooks flew overhead; not the usual ragged, weary flight to roost, but an oaring deep and strong with their wings." An oaring ... exquisite. Without becoming too evangelical, I hope I've inspired a few readers to take a wander over to the Candlestick Press website. They're a small Nottingham based company who print and publish in the UK and it would be a great shame not to be made aware of their titles. I think the booklets make perfect gifts and there's something for everyone - whether it's knitting, bicycles, chickens, clouds, telephones, tea, cricket, cats, dogs, puddings or relatives ... and much more! I'm tempted by a couple of the Christmas volumes; I like the look of 'The Christmas Wren' (also in Welsh) and 'The Gift of the Old One'. New anthologies coming out this year include poems about Picnics, Rivers and Walking, among others. 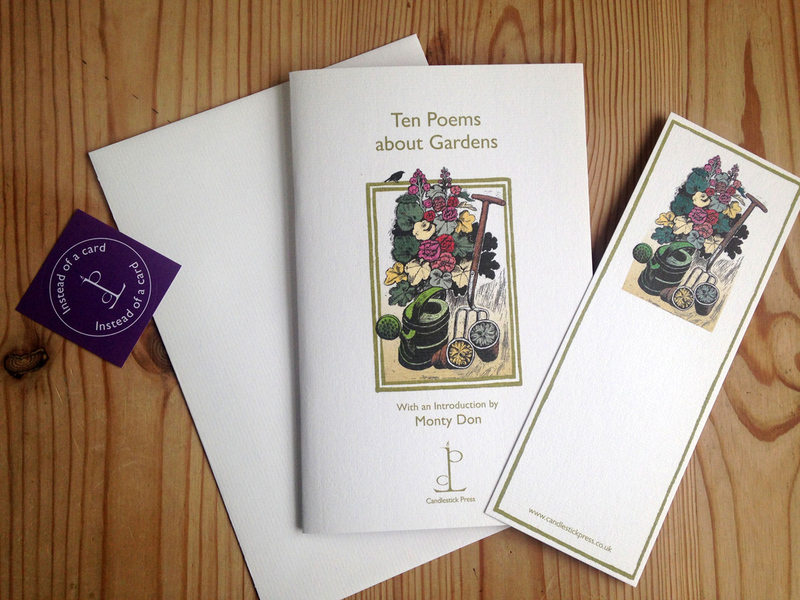 Candlestick Press and their range of 'Instead of a Card' poetry pamphlets, can be found here. 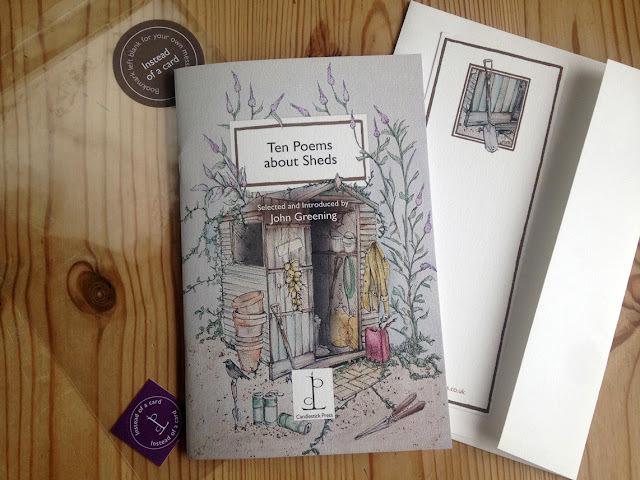 Poetry pamphlets are stocked at over 300 UK card and book shops, including some branches of Waterstones, Blackwell's, Amazon and, best of all, probably your local book shop. They can also be ordered online via the Candlestick website, postage is £1.25 for up to 2 booklets, or £1.65 for 3-4 booklets. Postage is by 1st class Royal Mail for speedy delivery. My appreciative thanks to Candlestick Press for the review copies. Great Review and I will most definitely follow up. I found myself wanting to read - and have - them all, Anna, initially based on the beautiful covers but the content is great too. Strangely, I hadn't come across them before and am thrilled now to know about them. So pleased to have reminded you of them - yes, let's buy more!